Now here’s a treat! We had one of the most relaxing, enjoyable meals of our stay in Las Vegas at Nobhill in the MGM Grand. Chef Michael Mina brings a bit of San Francisco to Vegas, and it’s fantastic. From great food, to great service to comfortable surroundings, this is a must on your list! The restaurant itself is hip but also very inviting. Neutral colors, low lighting, and plush seats envelope you in style and comfort. Warm “San Francisco” sourdough bread is brought to your table to start you off, served with a selection of organic butters. As the butter melts into the hot, perfectly chewy roll–the ultimate comfort food–you know just how much you’re going to be cared for. The menu boasts a number of tantalizing starters and appetizers, such as Cheese Fondue with the restaurant’s signature sourdough bread, or an equally tempting and enormous Shellfish Platter. We chose the Charcuterie Board, featuring delectable smoke meats and sausage, tangy cheeses, and incredibly mouth-watering marinated olives. Served with warm foccacia bread and a selection of mustards, this starter was perfectly satisfying. The whole grain and lavender mustards were particularly noteworthy–I could have eaten them up with a spoon. Our selections for the main course are certainly worth writing home about! My dining companion had the famous “Michael’s Lobster Pot Pie.” And yes, it is as rich and decadent as it sounds. The pie features a Two Pound Maine Lobster, Fingerling Potatoes, Seasonal Vegetables and a rich Brandy Cream sauce. Presentation is part of the fun: Our server arrived at our table with a large pot fit with a pastry “lid” atop a wheeled cart. The tender, golden crust was cut from the pot and placed on the dinner plate. The pie “filling” was then ladled in generous spoonfuls over the crust: heaps of sweet lobster meat, tender potatoes, and beautiful vegetables, all artfully presented. It is a monster of a course, but absolutely fantastic in every aspect! For myself, I chose the Crispy Skin Japanese Snapper served over Butternut Squash Risotto, Chanterelle Mushrooms, and a Red Wine Butter Sauce. The flavors were so wonderful and complementary! I especially enjoyed the contrast of the salty, crispy snapper skin with the sweet, creamy butternut squash risotto. Based on the attention to detail and flavor in the dishes we ordered, you surely cannot go wrong with any of the entrees. And there are many offerings to tempt you (including non-seafood options), from seasonal tasting menus, to courses like Suckling Pig with Perigord Truffles, Red Snapper with Cauliflower puree, and a twist on comfort food: Whole-Fried Chicken For Two Truffle Mac N’ Cheese and Onion Jus. Lest I forget, our meals were accompanied by a sampling of creamy mashed potatoes in various flavors: sour cream and chive, curry, mustard, horseradish, and classic. Served “family style,” this “side” was an unanticipated delight. I personally loved the exotic curry flavor and hot horseradish, while my dinner companion’s top choice was the sour cream and chive. Truly, there’s something for everyone here! Nobhill features a good wine list, with plenty of tantalizing white wines to whet your seafood-inspired palette. There are choice reds, to be sure, but I feel you can never go wrong with a crisp, French Chardonnay, with that distinctive mineral undertone. Perfection! How did we manage to have dessert, you ask? How could we not, I say, based on the calibre of the rest of our meal! I was delighted to find a twist on my favorite, crème brulee; the Cinammon Spiced Creme Brulee with Crisp Brown Sugar wafer combined the rich creaminess of crème brulee with my favorite spice. My chocolate-fiend companion enjoyed every bit of the decadent Valhrona Chocolate Soufflé with Milk Chocolate-Espresso Ice Cream. Service was flawless. Our server was knowledgeable, friendly, helpful and attentive and kept the evening relaxing and laid back. We recommend dining at Nobhill and will make it a priority to return there on our next Vegas trip. We give Nobhill Five Stars – Outstanding! 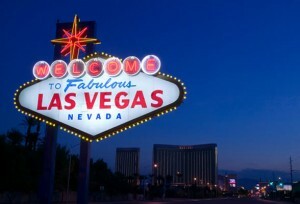 For more information or to make reservations, visit www.mgmgrand.com or call (702) 891-7337. In short, there is nothing like Joël Robuchon At The Mansion. The heavy doors to the dining room separate you completely from the ding-ing, whirling, beeping, flashing slot machines that are otherwise the hallmarks of your Vegas experience. You enter into a space of supreme elegance in mauve, lavender, and black. Plush, velvety fabrics, a crystal chandelier, and an intriguing wall of greenery surround you. The space is small, intimate, and graceful, much like the food–truly little works of art–that you will be served. Famed French Chef Joël Robuchon has created a menu “degustation” unparalleled by any restaurant in Vegas, and likely by any restaurant in North America. From the decadent 13 course list, to the exquisite delicacy of the ingredients, to the soaring bill you will face when all is said and done, Robuchon is far more than a meal; it is an unforgettable event. Named simply after the central ingredient, the offerings on the degustation menu for our visit included Le Caviar, La Truffe, Le Boeuf de Kobe, and La Langoustine (Robuchon’s signature). Each course is delicate and presented with the exacting hand of an artist. The dishes and trays chosen for each course reflect the color, texture, and ethnic inspiration of the ingredients. Flowers garnish ambrosia-like concoctions. Sauces are dotted onto your plate with geometric precision. No luxury is spared, as dishes accompanied by gold leaf or marked by more caviar than one can readily consume surely attest. The food defies description and must be experienced to truly understand why Robuchon is known throughout the world as the “Chef of the Century.” If you do go, stop to savor each bite, as every one is a revelation of complementarity and balance. Robuchon seems to gravitate toward unusual, delicately flavored foamy concoctions. He liberally accompanies dishes with fine truffles. By course number 9 or 10, you wonder how on earth you are going to manage. It is all rather too much, really. For the stomach, for the palate, for the brain. But then again, of course it is. 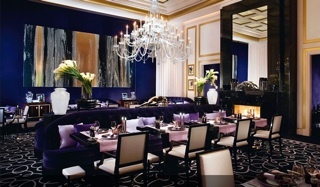 Robuchon, on the surface so alien to Vegas, is in fact right at home–in its appeal to your inner Hedonist. The wine list is, to be sure, out of this world. But the varied flavors on the tasting menu make picking the perfect wine a challenge, if not impossible. With a desire to match at least most of the courses and to indulge in a wine as fine as the meal, we selected a Burgundy –Cote de Nuit, Dom Rene Engel 2002. Our sommelier was supremely knowledgeable, and as French as they come–an unusual encounter in a city as American and over-the-top as Vegas. And of course, the fleet of servers and attendants is constantly clearing away this, and refilling that, before you even know your needs. The service is so good and attentive it is almost too good, taking perhaps a fraction of intimacy away from the meal. You are presented with a menu tied in a delicate ribbon as a keepsake. Each guest is also given a huge (no exaggeration here) loaf of brioche as a token of thanks, highly unnecessary, highly decadent–actually, a fitting conclusion. We certainly recommend dining at Joël Robuchon to those who love food, cooking, wine, and fine service – it is simply an extraordinary experience. We give Joël Robuchon Restaurant 5 Stars – Outstanding! 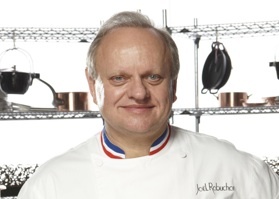 Joël Robuchon Restaurant is located in the MGM Grand Hotel and Casino, 3799 Las Vegas Boulevard South, Las Vegas, Nevada 89109. For more information or to make reservations, call (702) 891-7925 or visit www.mgmgrand.com. Bradley Ogden is located in Caesar’s Palace, Las Vegas, Nevada. For reservations or for more information, call 1-877-DINING-CP (1-877-346-4642). Decor: The tone is subdued, with brown earthy tones and low lighting. Artwork in the main dining area follows this theme with muted brown on cream colors. The seating arrangements create a cozy, intimate feeling especially with the several, semi-circular cushioned booths. The total effect is contemporary but very understated; strikingly different than the ostentatious décor of the Caesars Palace casino. Food: To start, we sampled the foie gras with persimmon and candied fruit. The foie gras itself lacked the melting, buttery quality we’ve enjoyed in the past (it certainly did not live up to the “gold standard” of foie gras served at Picasso’s in the nearby Bellagio Hotel.) and it was served with a puzzling wheat-like wafer that did not seem to fit the dish. We also tried Bradley’s Caesar salad, which seemed to forego the usual generous helping of garlic in favor of a lighter, more refreshing taste. Since we happen to love garlic, the salad, though enjoyable, was not quite what we were expecting. Following our server’s recommendation, we had the Pork Chop entrée. This was something to remember! First of all, the pork was prepared perfectly; it was hot, juicy and incredibly flavorful. Second, it was brilliantly paired with the wholesome taste of apple-smoked bacon, crumbled generously on top and thin apple slices. Third, the accompanying touches were terrific as well: beautiful, slightly crispy potato croquettes, red cabbage infused with an apple taste and (perfectly) wilted greens. This dish definitely testified to Bradley Ogden’s skill with “farm fresh” ingredients. For dessert, we had a pleasant assortment of cheeses accompanied by a slice of honeycomb dripping with fresh honey. With the exception of the entrée, the food was not as spectacular as we had hoped. Perhaps our feelings about the menu were affected by the less-than-polished service we received (see below). As one of Caesar’s Palace finest restaurants, we were expecting more. Wine: The wine list was very thin, both literally and figuratively, and our server had limited knowledge about it, which was disappointing. Our server was visibly nervous and seemed inexperienced. For example, she had difficulty pronouncing some of the words of menu items, and had never heard of our wine selection. This was all quite likely due to inexperience. To her credit, our server made the excellent recommendation of the pork chop entrée and she was certainly attentive to the important matter of food allergies. However, overall, we expected a greater level of professionalism from a restaurant whose prices and promotional materials position it as fine dining establishment. Dress Code: Business or resort casual wear was sported by most guests. Jackets are not required, but would hardly be out of place. Price: Expensive, with entrees in the $30 range. While the entrée was notable, the appetizers were a bit disappointing for the price, and the service was far from outstanding. Reservations: Reservations are recommended. The restaurant seems to be a popular dining choice for those planning to catch the spectacular Celine Dion “A New Day” show housed in the Coliseum across from the restaurant after dinner. For dining reservations, call 1-877-DINING-CP (1-877-346-4642). Overall Dining Experience: Very Good.